My I have a ton of tags and awards to do! Well, here we go. I want to thank Bess of Bess' Bag for the following tags. THANK YOU! ~Choose any amount of friends, blog friends, or real life friends, & say at least two things (or more!) you admire or like about them. ~Tag the friends you wrote about. 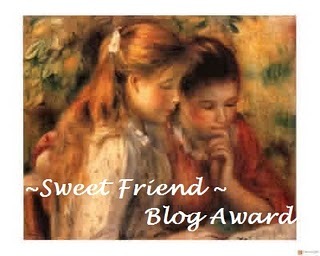 ~If those friends have blogs, be sure to link back to them! I want to tag my following friends. ~Tag at least five 'sweet friends,' on Blogger. ~Answer the tag (below) in your post. ~You may tag the person who gave you this award. ~Don't forget to comment on the post that awarded you! You are _______ in your family. AH!!!! Maybe vintage fashion, or my sewing projects! -List 5 random things about yourself. -Award 5 stylish blogging friends. 1. I have a fear of Aquariums. Or any tanks that are full of water that surround me. 3. My favorite animals are on the same food chain. How sad. They are Killer Whales, Dolphins, Seal Lions, and Penguins. 4. I enjoy writing/telling children's stories (picture book type). 5. I love saving things! May that be stuff from trips, fabric, buttons, just about anything. It was really bad, when I was younger I would save candy wrappers and every single scrap of paper I wrote on. I'm now able to through things away. ;-) But sometimes that is hard to do, for everything has a memory for me. This award is for those girls whose blog is lovely, pure and Godly! A) Post about your tag! 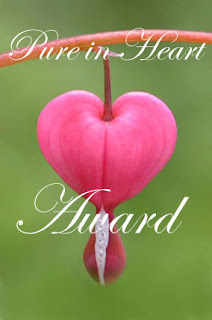 B) pick ten bloggers who deserve the PURE IN HEART award. C) leave a comment on the ten people's blog, and tell them that you tagged them! You might want to leave the link, too (you may tag whoever you want, including the person who tagged you, if you like). 1: Apples, Oranges or Bananas? APPLES! 2: How many siblings do you have? 4. 3: How old are you? 19. 6: describe your dream house. An old house with lots of character and charm, in a city. Yes, I'm a city girl. 7: Is your room clean? Kinda. Sometimes it is and other times NOT. 8: If you could be a movie character for a day, who would you be? 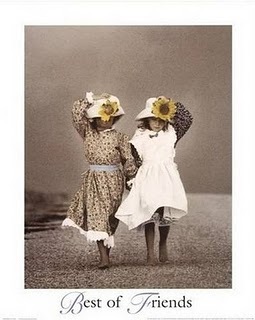 Oh boy, I guess I would be Anne of Green Gables, or Pollyanna. 9: Italy, Greece, France, Spain or England? AH! I would love to return to England. But I guess I'll go with Italy, got to love the food and sites! 10: What denomination are you? 11: Do you sleep with a stuffed toy (BE HONEST!!!!) When I was "younger" I slept with my huge rag doll. She used to be the same height as me, then I grew. 12: Gum, chocolate, or jelly beans? CHOCOLATE! 14: Favorite ice cream flavor? Mint Chocolate chip. 15: If you had to eat one type of food for two weeks, what would that food be?If I wasn't gluten-free right now, I would say pizza. Now, Almond Flour Flapjacks or Almond Flour Chocolate Chip Cookies. They are the BEST! 16: What is your favorite Olympic sport? Figure skating. 17: If you woke up and discovered that you had turned into Miley Cyrus for the day, what would you do (note, I am NOT a fan)? I don't really know who Miley Cyrus is! :P I guess take my family to Walt Disney World. 18: Describe yourself in three words. Shy (But once I get to really know you, I'm not anymore. ), creative, loves her family. Any who hasn't done this tag considered yourself tagged! And the final award is from Grace. Thank you Grace! 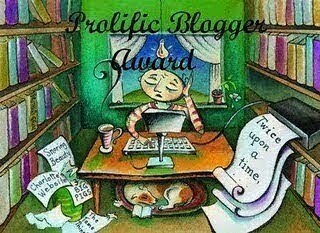 A prolific blogger is one who is intellectually productive, keeping up on an active blog with enjoyable content, after accepting this award, the recipients are asked to pass it forward to 7 other deserving blogs. Thank you everyone for your tags!